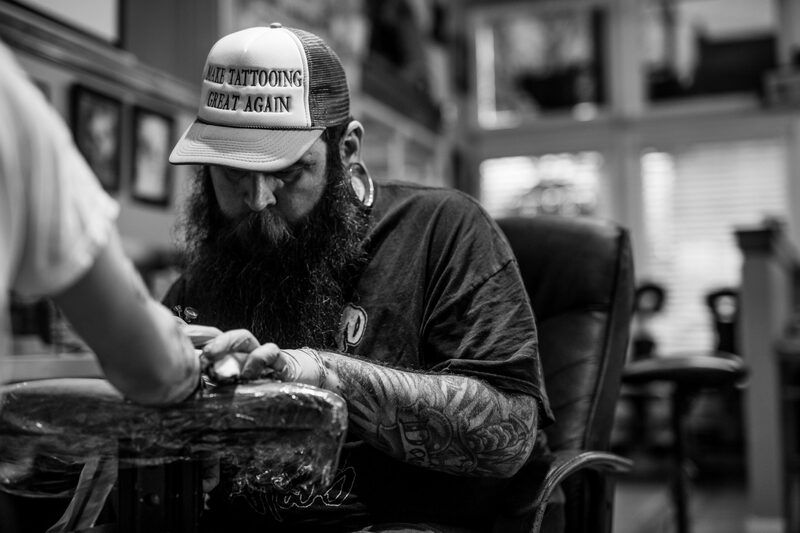 Shane Trevett became a tattoo artist 10 years ago when he started his apprenticeship at The Shamens Den in Binghamton, NY under the guidance of Shawn Vanoven. Shane has always been into the art of any sort. He is a very easy going, go with the flow kind of person and it's reflected in his work. He likes moving between a lot of illustrative styles mixing and matching to suit his moods. 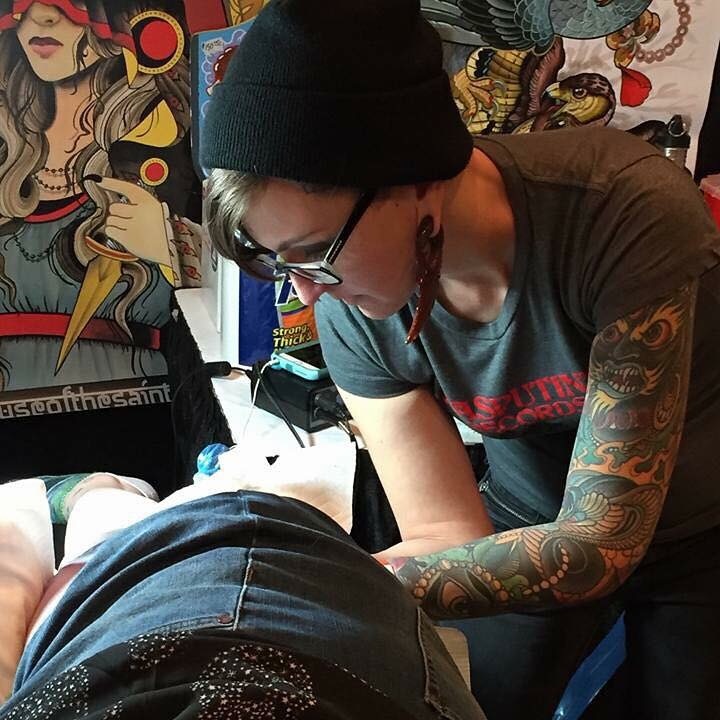 A lifetime traditional artist, and tattoo artists since 2005 currently working at Tymeless Tattoo in Baldwinsville, NY and formerly of Scarab Body Arts for seven years and Diversified Ink previously. Having studied under Ellen Haffar, Robert Niedzwiecki, Deborah McDowell, and the late Nick Todisco she strives to always pursue her art in many different mediums with a distinctive feel and style. Reoccurring themes are flowers, women's issues, and playful bright colors mixed with sometimes macabre and gruesome imagery. When used in combination it creates a feeling of aggressive femininity. 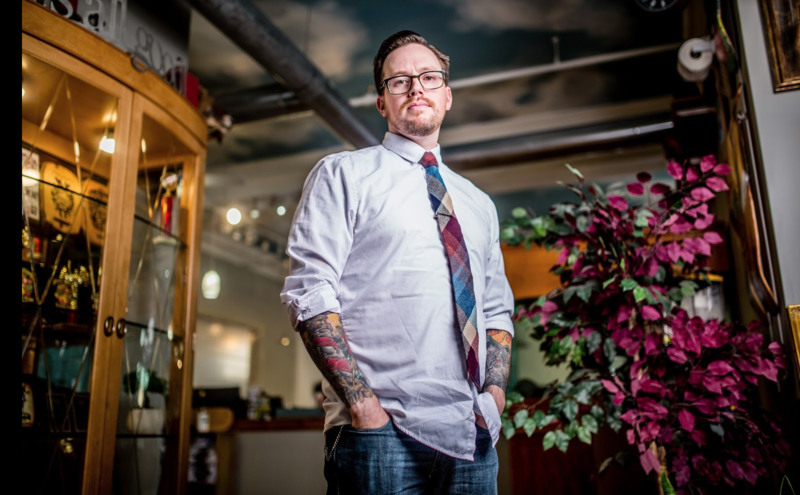 Jim has been tattooing in the greater Central New York area for over ten years. 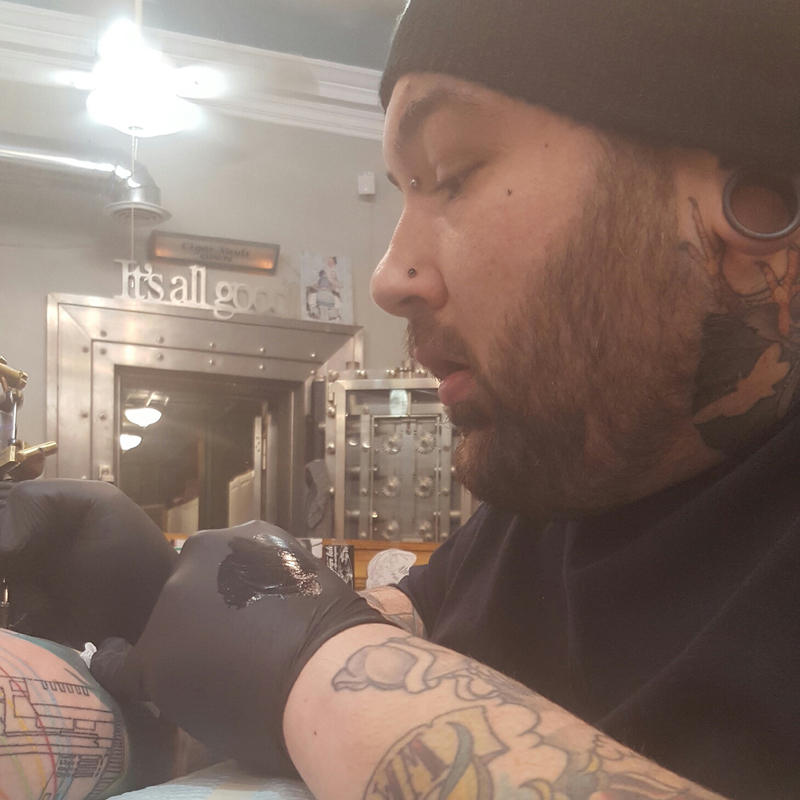 He has experience with many different styles of art and tattoos, however he prefers to work with vibrant colors and bolds lines. 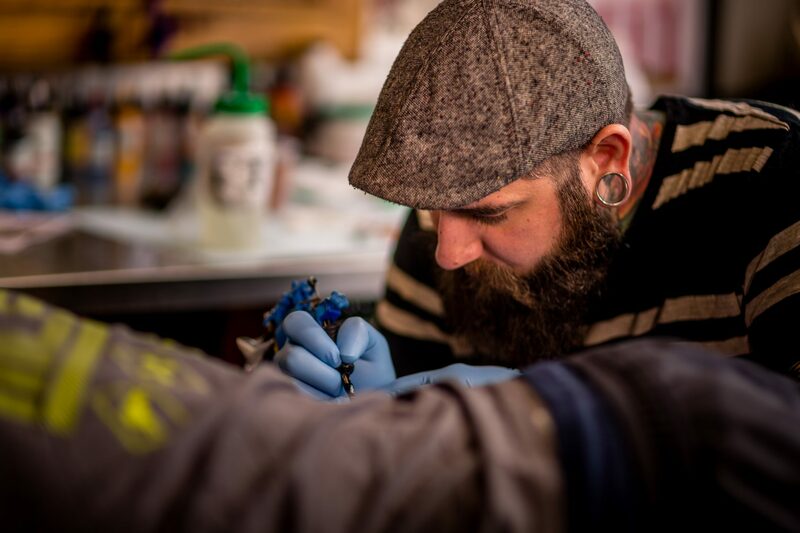 A custom artist with a degree in Graphic Design, Jim is highly talented and capable of transforming your ideas and feelings into a striking and elegant piece of art to be worn with pride for many years to come. 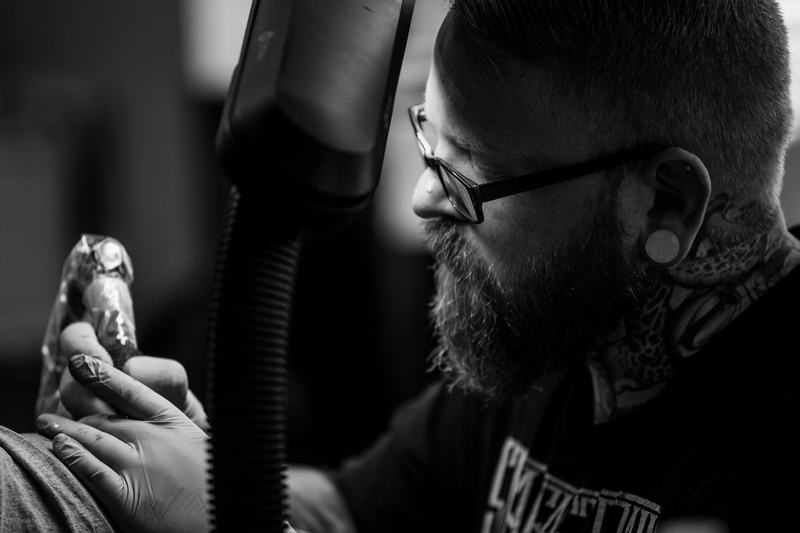 Jim especially enjoys doing biomechanical and abstract organic tattoos, with an emphasis on glowing light forms and hype realistic three dimensional textures that fit the form and movement of the human body. Sir Eric Wilcox specializes in pattern related blackwork utilizing dotwork. Flavors of mendhi, henna, and geometry throughout. He also enjoys western traditional/american traditional. 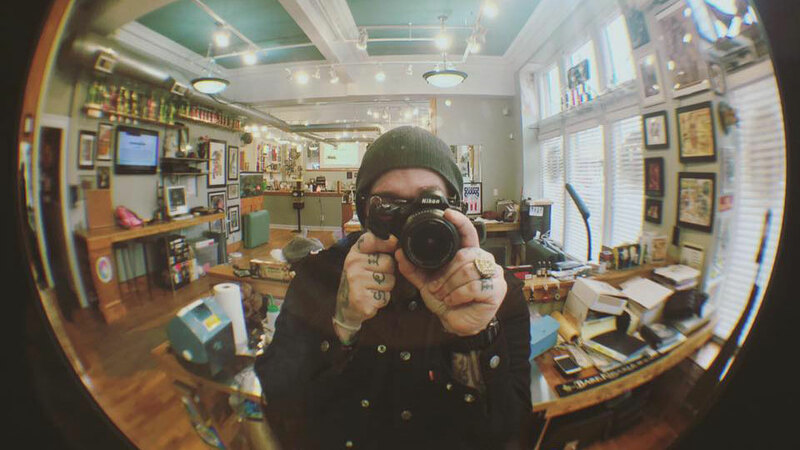 In that time he has felt the pressure of becoming the "cool tattooer". We are successful due to the talent and diversity of our artists. 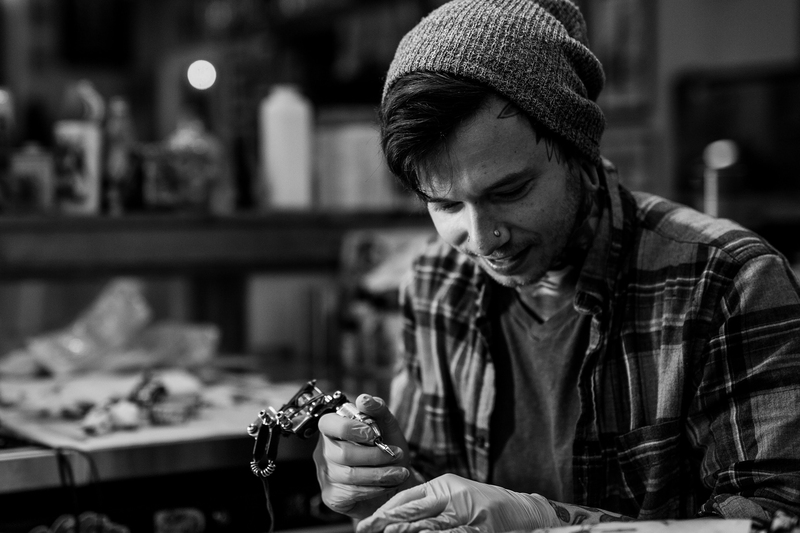 Strategically located in the lobby of Tymeless Tattoo, our art gallery offers all different kinds of pieces displayed by local artists as well as our very own residential tattoo artists. In this warm and spacious atmosphere, where works of art hang from pallet wood walls, visitors and clients can appreciate the dynamics of every piece of art. It's hard to put into words how amazing my experience was with Kyle. Not only is Kyle a great guy, the artwork he put on my arm is incredible. This tattoo of my beloved Jasper meant the world to me. I was in tears when I looked at it. His shop is impeccable and all of the artists there do excellent work. I'm looking forward to getting more ink there soon! I just had my first session yesterday with Jim Sidelinger. He was very thorough, quick, and detail oriented! I am beyond satisfied with the work he did. I cannot wait to see what the finished product looks like... I'm sure it will be above and beyond my expectations!!! The shop itself is beautiful & clean. The staff is very nice. This is definitely my go to shop! Would highly recommend to a friend! You won't be disappointed!!! I'm a long time customer of TT. I've been going here since I was LM and have always loved how wonderful all the staff has been. Today I took my mom in to get her first tattoo. She was so nervous and didn't know what to expect. Every single person she talked too made her feel at ease, relaxed, and ready. Thank you for not only treating me but my loved ones with such kindness. You guys made the drive from Long Island so worth it!!! The shop is full of some of the best artists in the biz! Everyone is always so welcoming and make you feel at home. Most of my tattoos are done by Jamie Santos who is amazing! Seriously I will only get tattoos from Tymeless. I trust all of the artists there, hands down the best! James Coldiron is by far the best tattoo artist I have ever had work on me..I have tattoos from LRRS before he was born and have had multiple artists over the years but none as creative and vibrant as his work. He is focused & attentive to what you want done and extremely worth the price he charges. Take it from someone who has seen and I have seen good and bad tattoos. You won't be disappointed. #L Best tattoo shop I've ever seen hands down! Shout out to Eric Wilcox did a amazing job on revising my black panther tattoo, adding a background V it and hooking my girl up with our sons footprints! Amazing work, friendly, good artist and great shop atmosphere! My cousin and I ( we got matching tats) had our first Tymeless experience a few days ago... and we couldn't be happier! Great environment, the guys are super nice... BIG thank you to Shane and Todd for the awesome job... I know I will be coming back for more! Great shop and even better staff. TT has the best artists hands down. I encourage anyone looking for a great experience and quality work to check them out.